Don't let bulky AC adapters block two or three outlets on your power strips. 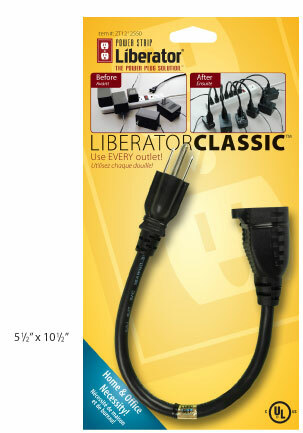 Liberate those outlets with the Power Strip Liberator® Classic cord. Just plug those big blocky power adapters into Power Strip Liberator® Classic cords and you'll free up previously unusable power strip outlets! These durable short extension cables are built to last and meet or exceed all electrical code and UL requirements for safety.